*1947 in Bangkok, Thailand. Dichterin und Übersetzerin. Sie war Professorin für Geschichte an der Tenri University in Japan, Associate Professor an der Silpakorn University of Thailand und Gastprofessorin an vielen weiteren Universitäten u.a. in Vietnam und Indien. Sie nahm teil an zahlreichen internationalen Poetry- und Literaturfestivals. Ihre letzten Gedichtbände: Springs and Autumns Speeding Through Time auf Thai und Englisch, und hidden face flower von Mai Văn Phấn, Übersetzung aus dem Vietnamesischen in Thai und ins Englische. *1947 in Bangkok, Thailand, poet and translator. She has been a history professor at the Tenri University in Japan, an associate professor at Silpakorn University of Thailand and guest lecturer in many universities a.o. in Vietnam and India. 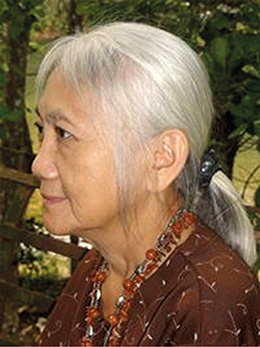 She participated in international poetry and literary festivals. Her latest poetry book is Springs and Autumns Speeding Through Time in Thai and English, and hidden face flower by Mai Văn Phấn translated from Vietnamese into English and Thai.